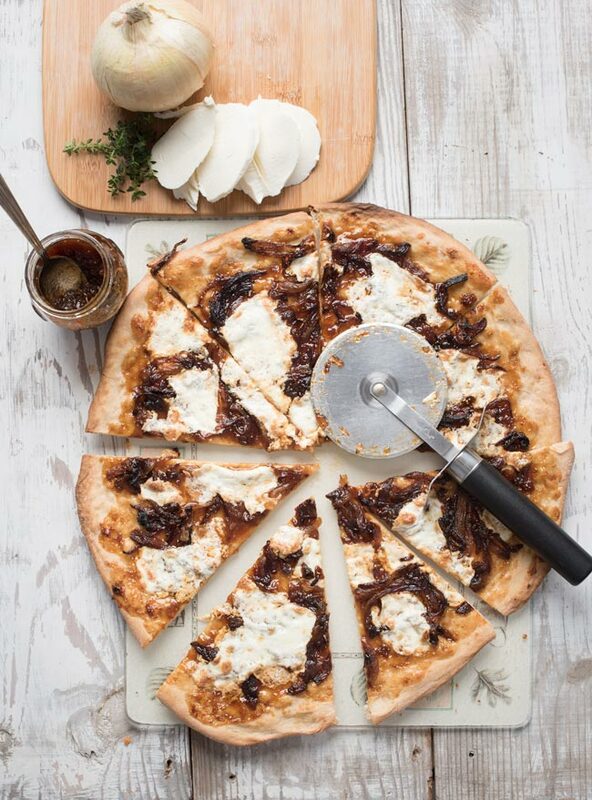 On the menu today we have Fig Pizza with mozzarella cheese and caramelized onions! 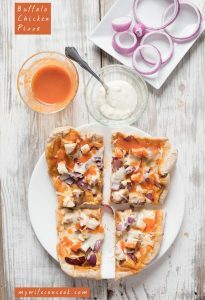 It’s a really simple 3-ingredient pizza (plus the crust) that really packs in a lot of flavor. 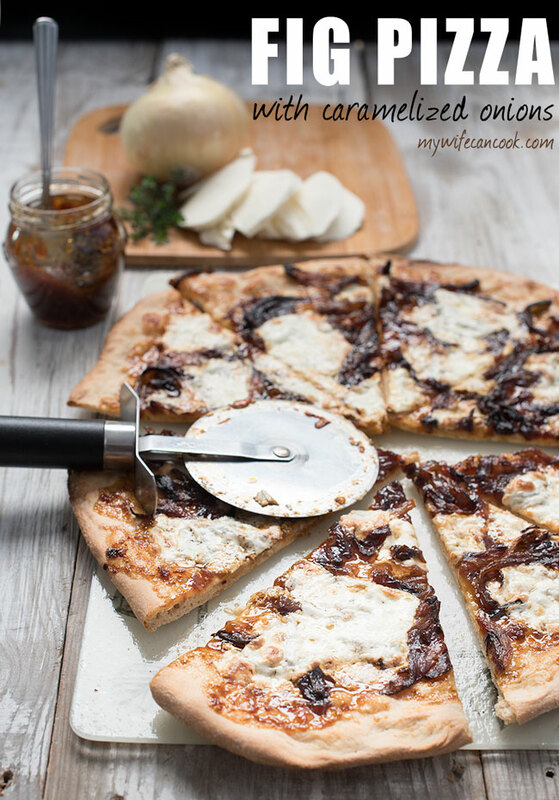 The mozzarella cheese is pretty standard for pizza, but the fig jam and caramelized onions really set things off! Can you handle it? Read on if you dare. Recently we fell in love with this Apple Brie Panini. We were in search of fall flavors which led us to apples. We then decided to experiment more with the combination of apple and brie cheese which works so well for this Apple Brie Crostini. And they worked again on the Apple Brie Panini, but another star ingredient almost steals the show…the caramelized onions! Oh, how I love caramelized onions. So sticking with the ingredient love theme, I started obsessing in my head over all the things that would be great with caramelized onions and continually came back to the thought of how great they would be on pizza (we like pizza)–it wasn’t a hard decision to go with pizza because we have a weekly pizza night tradition and have tested out many different ingredients. But what to pair them with? 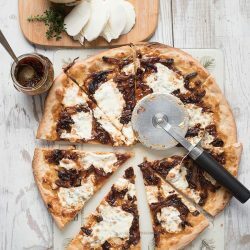 When my eyes rolled across the jar of fig jam I had in the pantry I knew I’d found my answer — fig pizza with caramelized onions! Several years ago we were at a restaurant that served a pizza with fig jam and it was amazing. So when I saw a jar of fig jam on a recent shopping excursion I grabbed it. I like to stock up on hard to find ingredients. But I had forgotten about it! 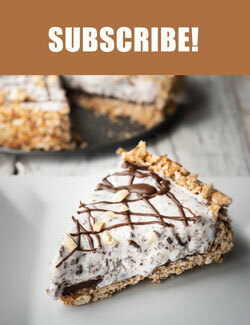 I guess the ingredients have a way of showing themselves when they are needed. 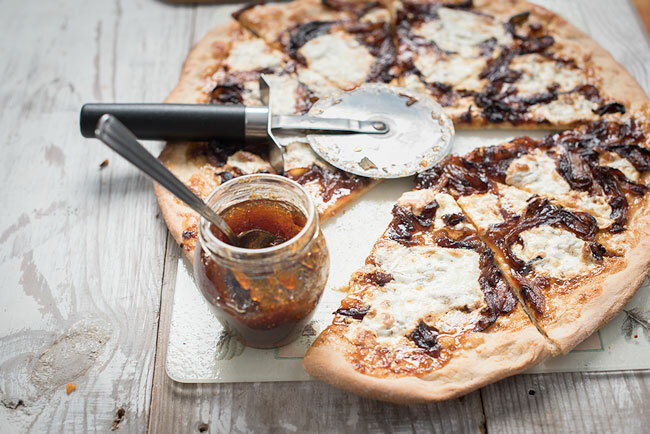 Fig jam pizza with caramelized onions it is. Okay, this step is crucial. Because you can throw some onions in a pan for a few minutes and cook them up and they’ll be pretty good. Pretty good…if that’s what you’re looking for. But if you want your onions to be great then that requires a little more dedication. I think we mentioned in our apple brie panini post that the key to caramelizing onions is time. It’s easily a 45-60 minute time investment. But, it’s totally worth it! There is a level jump in flavor. That’s not so bad, right? Mind you, not something for every day, but if you make it ahead of time or while you are waiting for your homemade pizza crust to rise, it isn’t that bad. If you’re looking for even more tips here are some common caramelized onion mistakes and how to avoid them. The second magic ingredient is, of course, figs. Figs have a distinct sweet taste that makes a bold statement on pizza. I know a lot of people like Fig Prosciutto Pizza, but I really liked the idea of pairing them with caramelized onions. And if you need more incentive for trying fig pizza, check out these fun fig facts. Now, let’s get to that fig pizza! Preheat oven to 475 F with pizza stone in oven. Spread fig jam on crust. Spread onions onto of jam. Distribute circles of mozzarella evenly on top. I used our homemade fig preserves for this. It was on the sweet side but good. 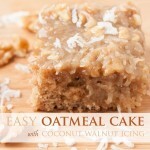 Next time I would probably use provolone cheese or add capers to balance out the sweetness. 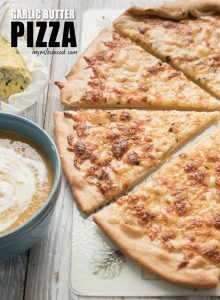 I like the idea of trying another cheese! 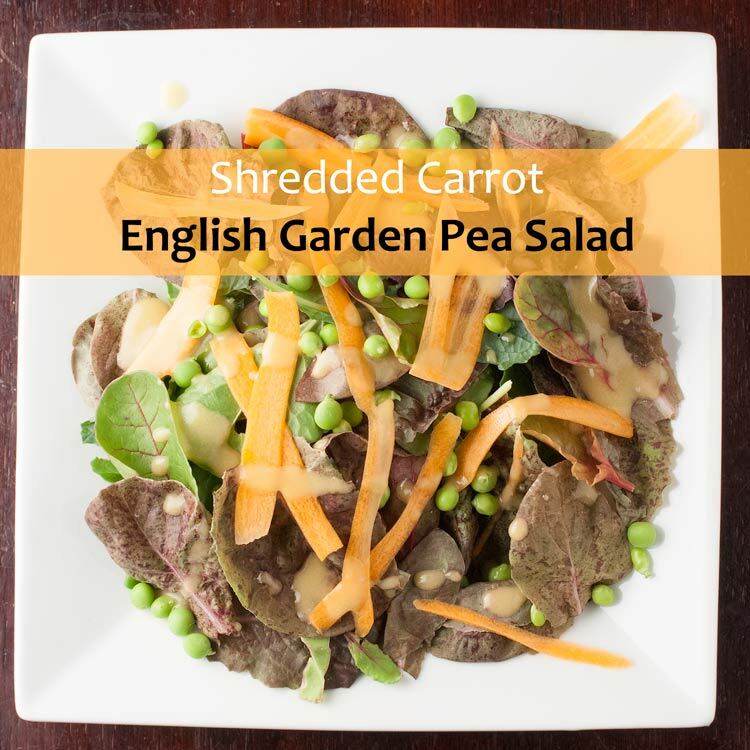 Let us know if you try something else! About how many raw onions will yield a cup of caramelized ones?